Hughes Seals the Victory With 0.9 Left ~ The Bucky Channel - The World of Sports from Wisconsin's Perspective. As hard as they tried to hold the lead, the Badgers just couldn't stop Virginia Tech's A.D. Vassallo from beyond the arc. 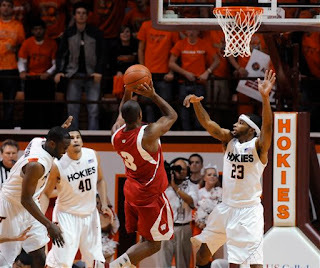 And when Vassallo's sixth three-pointer of the game capped a 14-5 Hokies run, the Badgers were tied with just seconds to go on the road. Hughes got points number 11 and 12 on a fallback jumper in the middle of the lane with just 0.9 seconds left on the clock, giving the Badgers the 74-72 victory. The Badgers won it with a two-pointer, but three's were the name of the game in this one. The Badgers were 12 of 18 from downtown, getting four from Landry, three from Bohannon, and two each from Hughes and Jon Leuer. The Badgers may have had the better record and the higher seed, but they were actually underdogs in this one. One of the reasons for that is because ACC teams have won their last 11 home games in the ACC-Big Ten Challenge. But the Badgers bucked the trend on Monday night, giving the Big Ten a jump start in the 10th annual event. More importantly, they gave me a head start in the annual Winks/Gweeds ACC-Big Ten Challenge, where I take all the Big Ten teams against the spread, while he takes the ones from the Atlantic Coast. Usually, I end up owing him money after it's all said and done, because of the ACC's dominance in the event. But if Monday night was any indication, maybe things will finally start coming up Milhouse.